When Hoppy's owner Diane unexpectedly collapsed and was rushed to the hospital, no one knew what would happen to the rabbit left alone in a metal cage along with the other animals at the woman's farm. Diane went into instant heart failure and was eventually pronounced brain-dead. 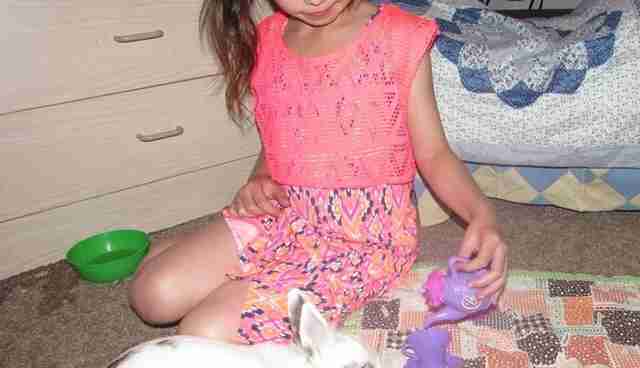 Her compassionate landlord agreed to feed and care for the animals until homes could be found for them. Friends and rescuers had the overwhelming task of placing the animals, including Hoppy, 15 dogs, and some horses and chickens, into new homes. "It eventually came to my attention that the woman had died, and I was asked to help in placement of the remaining animals on the property who were still not adopted," Amanda Sorvino, screenwriter, documentarian and animal advocate, told The Dodo. Many of the dogs had been dumped on the woman over the years by people in her community, according to Sorvino. She was a very big-hearted, compassionate person who took in dogs who no one else wanted, spending all of the money she had on dog food. 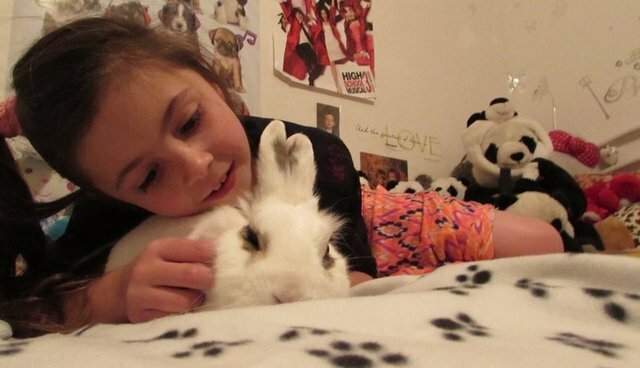 Hoppy ended up on the property because his previous owner was unable to keep him, so Diane took him and honored a promise to care for the rabbit. However, Diane could not keep Hoppy in the house because of inside dogs. 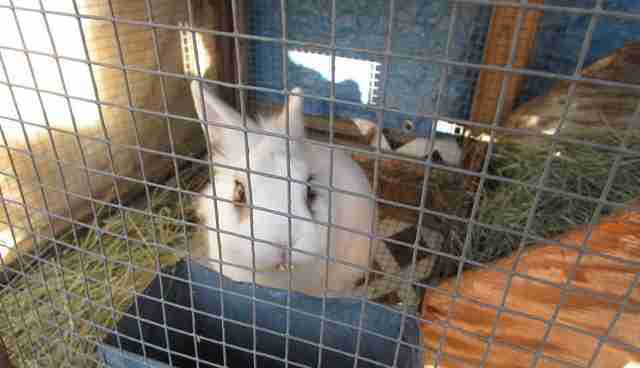 "She did not have the money to build a sanctuary, so the only option was to put him in a rabbit hutch," Sorvino said. "It must have been frustrating and lonely for him. He most likely longed to get out of the cage." "She did the best she could given the fact that she had a disability and she was getting older and had difficulty walking," Sorvino said. It was important to get Hoppy to a vet and into a good home. "He had some teeth issues, and was most likely inbred," Sorvino said. "He has overgrown teeth that are protruding from his mouth." 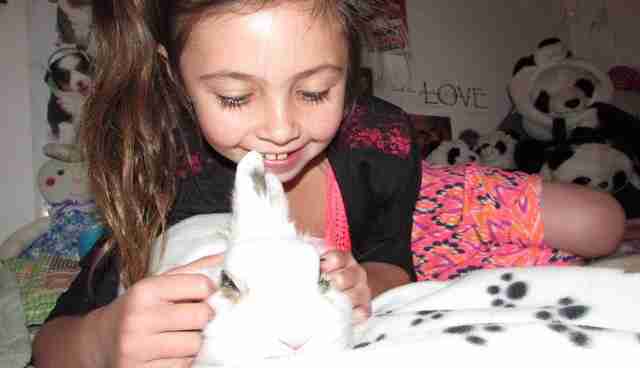 Sorvino and her boyfriend, Cody, took Hoppy in just days before this past Easter to foster him. Sorvino gave him free rein of a room and made sure it was rabbit-proofed. "He was really happy and loved being free," Sorvino said. Terri and Trey, a couple who also knew of Diane's fate, told Sorvino they would be happy to take Hoppy, and that their 8-year-old granddaughter, Belle, would be over the moon. Belle lives with her grandparents since her father died two years ago. 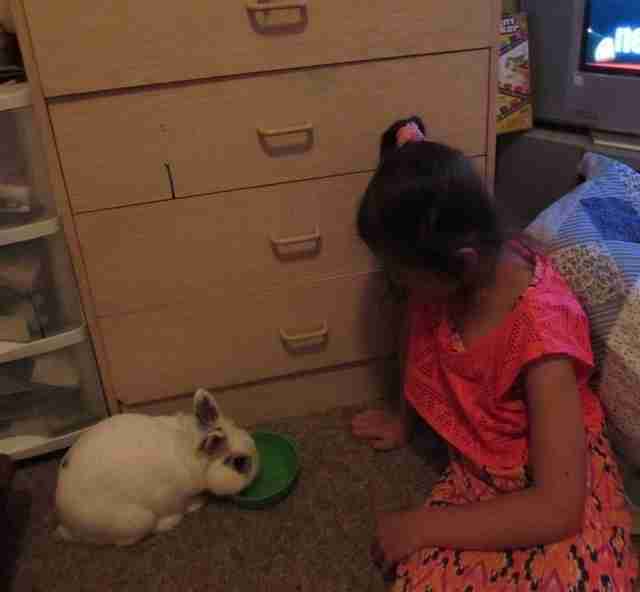 The first meeting between Belle and Hoppy coincidentally happened right after Easter dinner. Sorvino brought Hoppy over to meet the family. 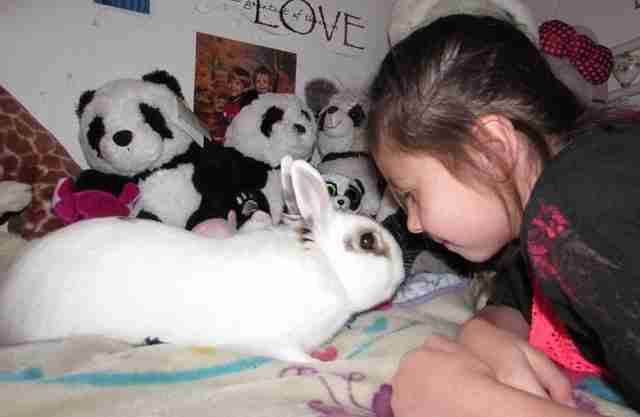 When Hoppy and Belle first met it was magic. "The two of them could not have been more compatible in every way," Sorvino said. "It was love at first sight for the both of them, and they seemed to understand each other." Hoppy has seen the vet, and is scheduled to have his elongated front teeth filed and reshaped with a burr under local anesthesia, in addition to being neutered before he becomes a permanent member in Belle's room. Luckily his molars are well aligned and in good shape. Sorvino has ensured that Belle's room is rabbit-proofed and brought over any necessary items for Hoppy's new home. "Neutering will make him more conducive to being a house rabbit in an environment where he will be in his new owner's room," Sorvino said. He will have free range of Belle's room and at different times he'll be monitored in the living room. Hoppy will recuperate at Sorvino's home until he is ready to head over to Belle's. Hoppy is very outgoing and personable. He also has a sense of humor as seen in a recent game they played using a plastic, toy teacup. "He took the teacup and ran away with it," Sorvino said. "We were under the assumption that he would not come back, but he came back. He was showing off that he was in possession of this teacup and he was so proud of himself." "He loves stuffed animals and really loves this little girl," Sorvino said. 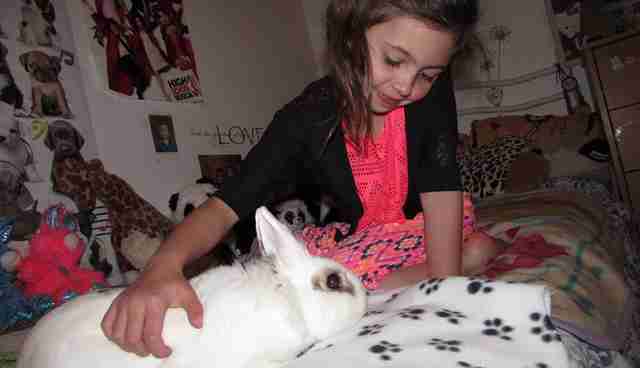 "I just saw a little girl who had recently lost her father immediately bonding with a rabbit who had lost his owner," she added. "In that moment I could see very clearly that they both understood their mutual loss. You could see that they could feel the same thing. 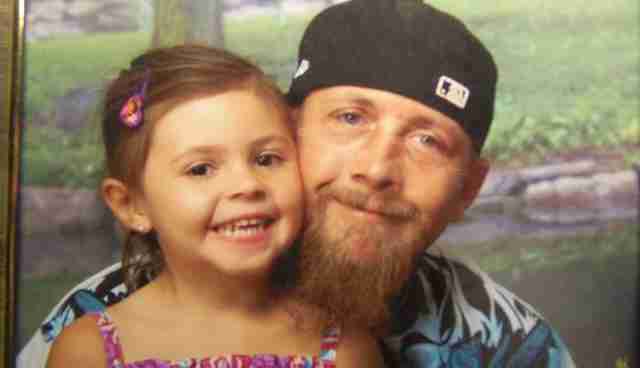 They made a mental pact to help each other heal." 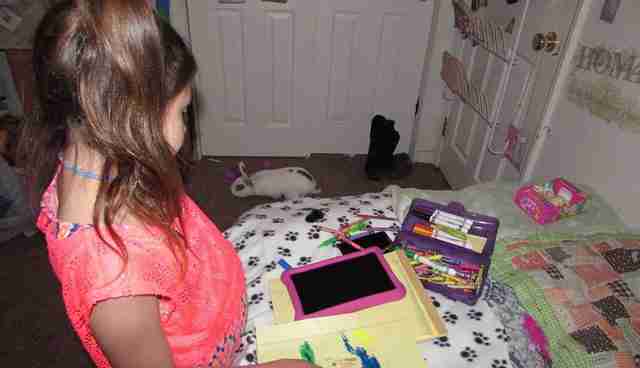 Belle hopes to write a story about Hoppy's life because she says she wants people to know that rabbits who come from life in a cage can find happiness. Follow Belle and Hoppy's Tea Party on Facebook. Thinking of getting a rabbit of your own? Make sure to do your research first, then visit Adopt-a-Pet.com to get started.